Birmingham native Junias Jackson had always felt a connection to the United States Army. For as long as he can remember, his father, a disabled Vietnam Army veteran, and uncle, a Korean War veteran, would tell tales of their time overseas. It was something that caught his interest at an early age, but it wasn’t until he was 13 that he knew he wanted to be in the military. “As a kid, I wasn’t sure what I wanted to do … but I knew that whatever I did, I wanted to be in a capacity to help others,” said the 34-year-old U.S. Army Captain and UAB graduate student. And for the past 16 years, that’s exactly what he has done. Jackson joined the Army’s Delayed Entry Program in July 2001, shortly before his senior year of high school. 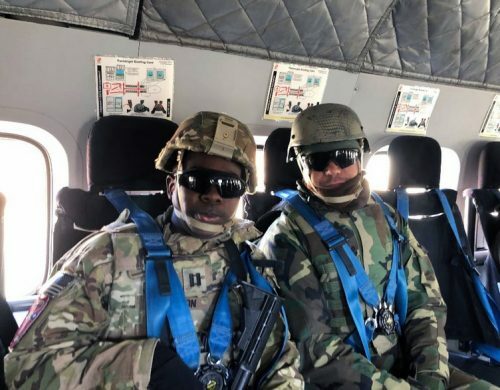 Following his high school graduation, he joined Active Duty Army and several months later Jackson was packing his bags and preparing for his first station in Mannheim, Germany. Over the years, the Army has given him the opportunity to live and experience things he never thought possible. From Virginia and Georgia to Italy and Iraq, Jackson spent time in places that he had only read about in books. The Army has not only allowed him an opportunity to experience life in other countries, it’s allowed him the chance to grow and lead. Since enlisting, Jackson has moved up the ranks and is now a captain. He’s worked various assignments with NATO and other partner nations over the years, and has had the opportunity to meet business leaders and leaders in the United States, as well as other countries. He’s also been a Commander twice. When Jackson is at his home base in Virginia he is the Force Development Officer, which entails developing the future structure of the Army, a job that is both challenging and invigorating. When home, he also spends as much time with his wife and 16-year-old son as possible because deployments can come up anytime, as he has learned over the years. He said the most challenging aspect of military life is having a fellow soldier killed or seriously wounded. “The relationships and bonds you forge in the military are very different from that of school or a job, especially when you’ve been on multiple deployments with someone,” he added. He would know. Jackson is currently on his fifth deployment — Operation Freedom’s Sentinel in Afghanistan. As the Afghan Security Forces Assistance Officer for the Afghan Special Operations Forces, Jackson advises and assists the Afghan military to ensure they have what they need to be successful. This particular job requires lots of travel as he visits the varied Afghan camps to meet with military officials. While not the easiest job, Jackson said it is definitely a rewarding one. But Jackson isn’t just a soldier and father and husband. He is also a graduate student at UAB. He is working on his Master of Business Administration simply to further his education and learn more about the field of business, operations and supply chain management, all of which is crucial knowledge in his current position. Jackson chose UAB for his graduate studies because he has that green and gold blood running through his veins. He received his Bachelor of Arts in history with a double minor in military science and Spanish from UAB; he also received his Army Commission through UAB Army ROTC. Jackson still stays in touch with his undergraduate professors, even while in Afghanistan, and his current professors and fellow students have been “very supportive” during his deployment. A perfect example of this support happened just a few months ago. 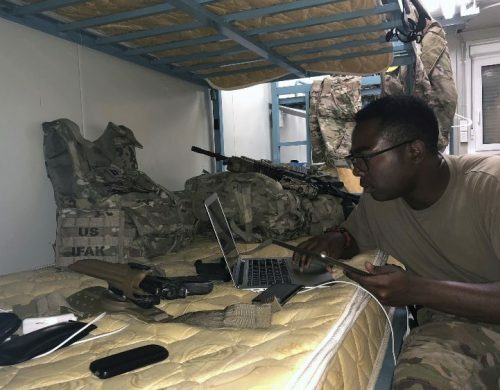 A textbook for his first class during deployment was supposed to be overnighted to Jackson in Texas a day before he deployed to Afghanistan, but that shipment was canceled because of bad weather conditions and Jackson did not get the book. However, a fellow student scanned every page of the first three book chapters and sent it to him. It took almost a month before Jackson had the book in hand, but between the student and his professor, Dr. Samuel Goh, he was able to keep up with his assignments and not fall behind. Mail is only one challenge of attempting a graduate degree while fighting for your country overseas. Communications, particularly the Internet, are also major obstacles. Jackson has a portable Wi-Fi hotspot and it works about “50 percent of the time in 50 percent of the places” whenever he leaves his main location. The communications infrastructure isn’t completely developed, but it is better than nothing, he added. UAB’s technical infrastructure is what makes it possible for Jackson to continue his education overseas. He takes full advantage of his iPhone and iPad with Canvas and the other apps that UAB implements. But this degree is more than just a piece of paper that will be framed on his wall. He is using what he has learned in his advise-assist role with the Afghan Army. He also plans to continue using that knowledge when he returns to Virginia. Ultimately, Jackson plans to go into business and supply chain management, with a focus on sustainable, environmental friendly processes and materials. When his military career ends, “as it inevitably will one day,” he would like to own a business that helps its employees get ahead and put them and their families in a better situation.